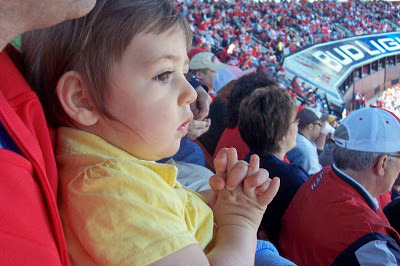 We went to the first of three Cardinals games we have tickets for this summer. 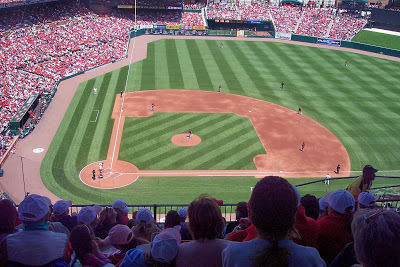 We couldn’t have scripted a better baseball afternoon: The weather was ideal, even chilly in our shaded seats. 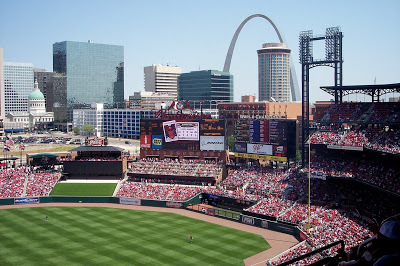 The Cardinals won in exciting fashion in the ninth inning. And Adam Wainwright pitched a beauty, even earning me a complete-game win for my fantasy team, which is struggling. But that’s another post for you sports fans. We drove through there about game time yesterday. We were on ourway to Brad’s nephew’s b-day party at Ft. Leonard Wood. I almost had Brad convinced to skip the party and stay for the game. Wish we had! I’m sure we would have had the Cubs been playing there. The day looks beautiful! Coors in your pics are great!